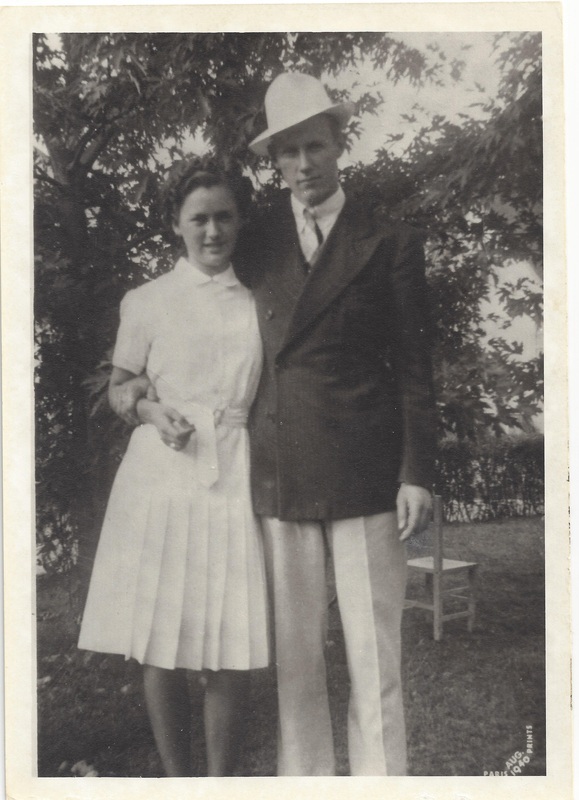 Ed and Ruth the summer of 1940. I was twenty-one years old during the European campaign of World War II. In the year of 1941, all able bodied male U.S. citizens were registered for a draft into military service by the United States government. There were a variety of draft classifications depending on your age, your physical health and your education. I was registered and carried a draft card classified as “A-1” which meant that I would be among the first to be drafted into the Army by the United States government if America were drawn into the war. On Sunday, December 7th, 1941 the day that the Japanese nation attacked Pearl Harbor unexpectedly killing thousands of sailors and soldiers your Grandmother Ruth and I were watching a film in a downtown Boston movie theater. Upon exiting the theater that Sunday afternoon we heard the news of the disastrous attack through the voices of newspaper hawkers on the streets shouting the bad news as they sold their newspapers. At that moment I realized that I would immediately be drafted into the Army because of my A-1 classification. 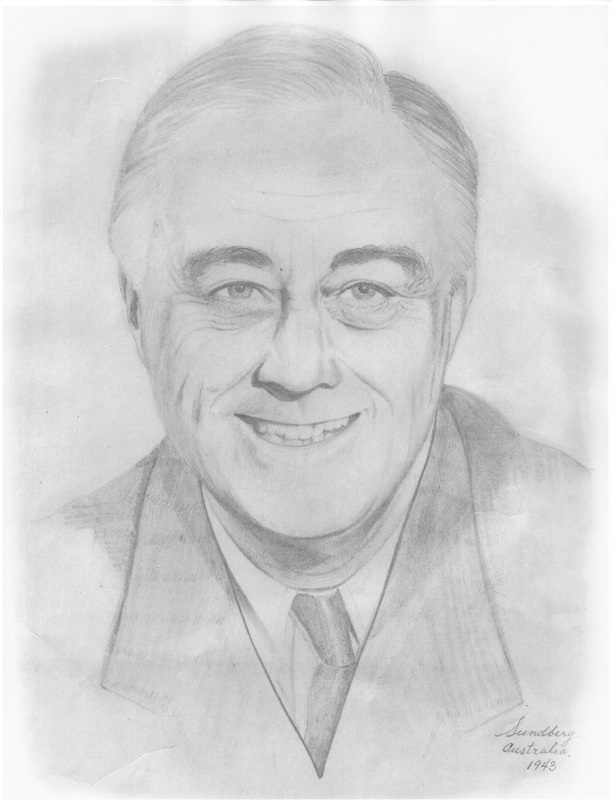 The following day in his speech to Congress President Franklin Roosevelt, declared war on Japan, which I listened to on the radio. I immediate realized that as a young man I had to defend our country. From our home in Dedham, Massachusetts I traveled by streetcar and elevated subway trains into the city of Boston to enlist in the Navy because I always loved the ocean waters and did not especially care to be drafted into the Army. When arriving in the city I was upset to find that there were lines of hundreds of men waiting to enlist in the U.S. Navy and guessed that the lines were some twelve blocks long. So I thought to myself, “what is the closest service to the Navy?” Only then did I realize that the U.S. Marine Corps were a big part of the Navy in manning the guns on Naval warships. So I found the U.S. Marine Corps recruiting office on the fourth floor of the Boston Court house. As I entered the sergeant behind the desk said: “Come on in Son”. At that time the enlistments into the Marine Corps were very large due to the excessive numbers being recruited from all parts of the country. The Marine Corp had only two U.S. training boot camps, the Marine Corps Recruit depot in San Diego, California and MCRD in Parris Island, Beauford, South Carolina. 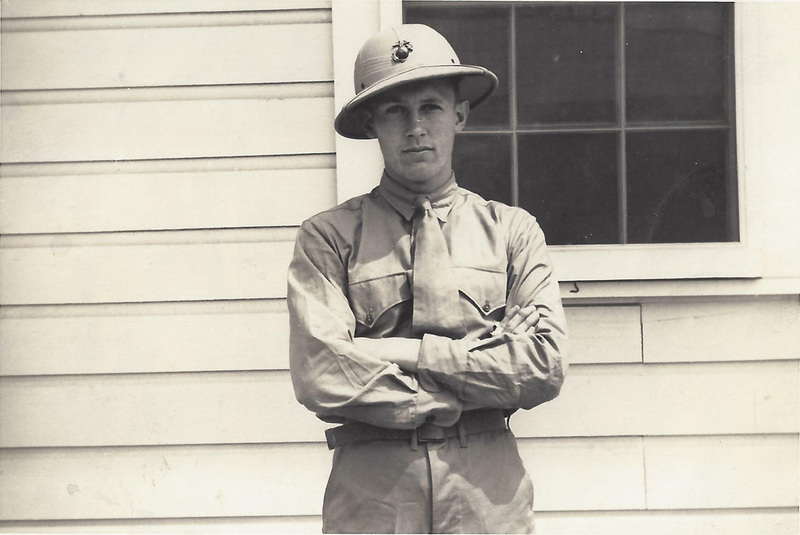 At that hectic time the camps could only train so many men at a time, therefore I did not get called to duty or receive my orders to report for training at Parris Island boot camp in South Carolina until January of 1942. Upon reporting to the Marine Corps boot camp at Parris Island, South Carolina on January 26th, 1942 every new recruit immediately had his haircut down to the scalp including myself. I missed my head of hair for a quite a few weeks, but then soon became accustomed to the lightness of the head. 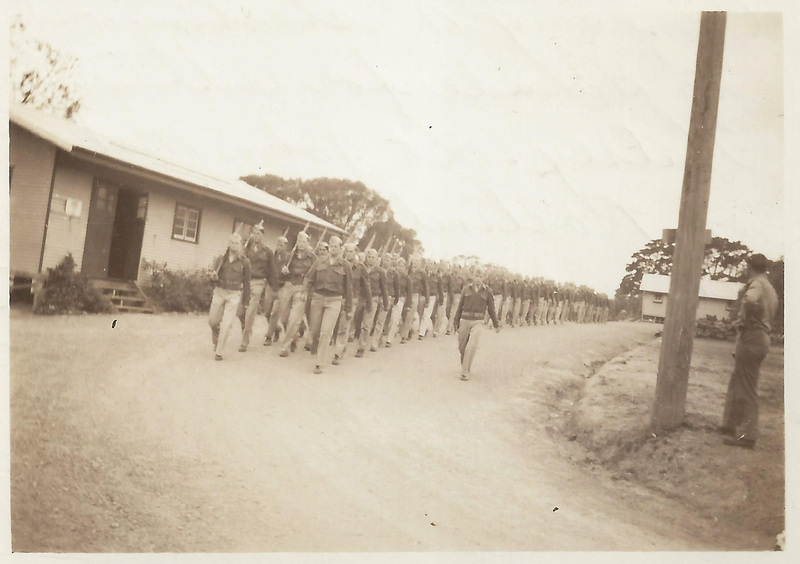 I was assigned to Training Platoon #129 along with some 65 other new recruits who were young men mostly from various Atlantic seaboard cities and towns of the eastern states. Training was extensive with early reveille, (wake up) at five a.m., then into a cold open air shower before dressing in green fatigue clothing. We were then lined-up at the chow hall for a large breakfast. Our day of drilling started at 6 a.m. sharp. We marched and marched in cadence for long hours and also into the evening hours to the commands of our D.I., (drill instructor). 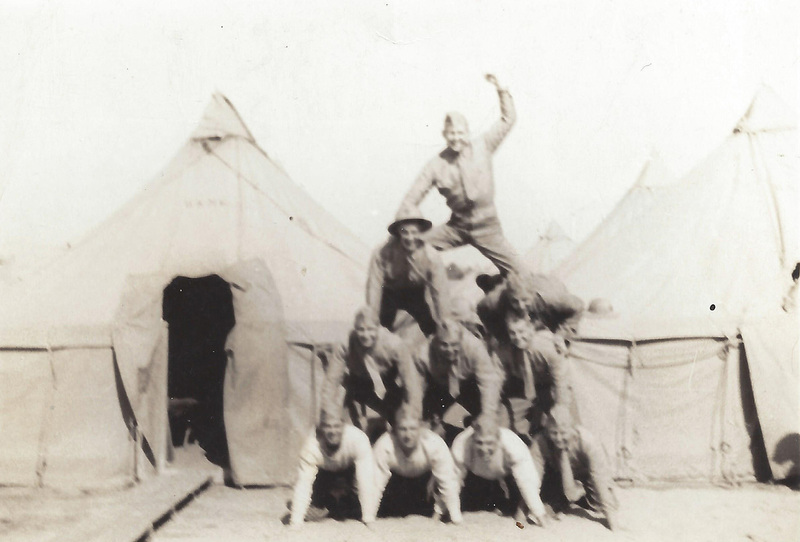 We enjoyed a huge dinner meal, fairly late, in the mess hall and taps were played for lights out and sack-time at 10 p.m.
Before graduating from the ninety days of exhausting workouts we had been issued World War 1, steel helmets, leggings, boom Dockers and Springfield 03 rifles, which were only single shot and were bolt action with a five-bullet clip. We fired the 03 rifles on the rifle range for over four weeks along with the Colt 45 pistol before I gained qualification as a Sharpshooter in both weapons. Every one of us was also qualified for the use in rifle baronet tactics after hours of drilling and instruction. The final task was enduring the fatiguing weakness from bodily and mental exertion during the “Crucible”, a ten day test of strength, (on your back), through three foot wide long concrete pipe against head-on flowing water, swimming with full backpacks including all your weapons and ammunitions, climbing over 20 foot high wooden barriers and crawling with full gear through mud under low strung barbed wires for over a hundred yards. Not all of us completed the “Crucible” which was a severe test that causes a lasting influence. However, those of us surviving that test were ready and qualified as Marines. 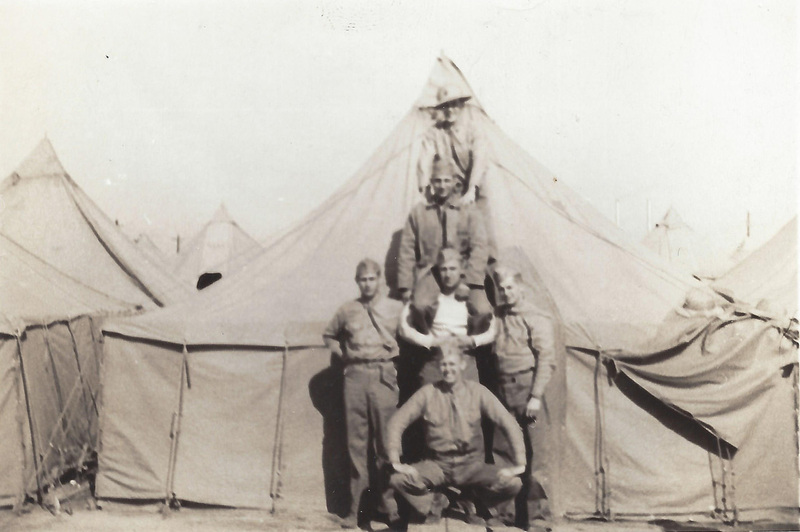 Upon graduating from Boot camp the last of April 1942 each of us were assigned to one of various companies at Camp Lejeune in North Carolina for advanced training. Every graduate from Boot Camp was assigned to a company in the newly formed First Marine Division. I, as a PFC, (private first class) was assigned to “A” Company, 1st Battalion of the Fifth Marine Regiment. “A” Company was made up of 200 Marines consisting of four platoons; three of riflemen, automatic weapons and machine guns and the fourth platoon were called headquarters with radiomen, naval corpsmen and intelligence personnel. During the next two and a half months we were taught advanced rifle range tactics during hundreds of hours of active firing and also received instruction on how to field strip, unassemble, and re-assemble, various weapons and the correct procedure in how to care and clean our rifles, machine guns and Browning automatic weapons to maintain their efficiency. A very important lesson was learning the correct procedure and when to pull the pin and discharge hand grenades. During our encampment at Camp Lejeune every other day we marched eight hours a day over 25 to 30 miles of rough terrain to keep us well fit for any future combat action. On May 17th we were ordered to pack our sea bags and gear for the train ride to Charleston, South Carolina where we boarded the USS Wakefield, a troop transport ship. After boarding the naval transport USS Wakefield, which had a total complement of 4,000 Marines troops on board, we set sail for the South Seas via the Panama Canal. The trip to the Canal took us four days during our southerly zigzag course as four US destroyers, two on each side, escorted and protected our ship off the eastern seaboard of the Atlantic Ocean. German submarines had already sunk a number of American vessels in the area; therefore it was necessary to be safely escorted by the naval destroyers. During those few days we witnessed the destroyers dropping their depth charges from time to time and we thought perhaps that they were practicing their skills. Low and behold after the war in reading the history of that trip I was amazed to learn that those four destroyers actually sank two German submarines during our southerly voyage from Charleston. Passing through the Panama Canal during the daylight hours was excessively hot and humid aboard ship because all vessels, in those days, did not have air conditioning cooling systems. Instead of sleeping in the four high canvas bunks in the hot humid decks below every Marine slept side by side in the open sky on the topside to stay a little cooler. After navigating through the locks of the canal we were then escorted approximately fifty miles southwest into the Pacific by four Naval PT boats. From that day on the ship was on its own and following a course south a couple hundred miles off the western coast of South America. Two days later and approximately 300 miles off the coast of Peru the ship ran into a fierce storm the likes of which I have never experienced as a sailor. The seas were thirty to forty feet high, from a southern direction and were crashing directly over the bow and the entire vessel. The excess roll and movement of the ship was causing almost everyone aboard to become seasick. There were not many of us that were fortunate enough to remain normal and well. Going to the empty mess hall for food was impossible due to the fact that most everyone was ill including the chefs and cooks, therefore no meals were available. After that 23-day sea voyage from Panama we finally arrived and berthed in beautiful Wellington, New Zealand harbor on June 14, 1942. Unfortunately due to a local longshoreman strike we, the troops, were put to work unloading the supplies and equipment from our transports. 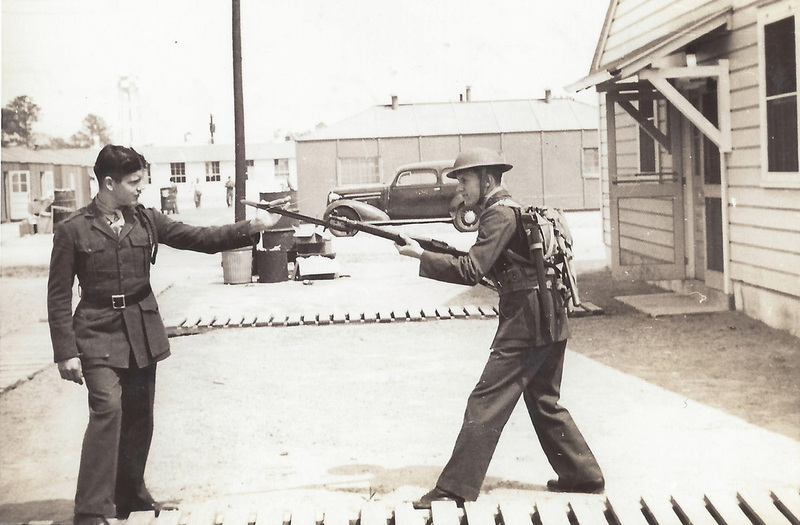 Once the ships were unloaded, two-thirds the 5th Marine regiment moved about thirty miles north of Wellington to Paekakariki Training Camp at McKay’s Crossing where we bivouacked in the mountains for an additional eight months of training. Major General Alexander Vandegrift, our lst Marine Division commanding general was sure he would need all the promised time, until January 1943, to turn the division into a cohesive fighting force. During the six weeks in the Wellington area we were issued liberty one day a week and as most of us were single we enjoyed meeting the local young girls by attending the ballroom dance halls, which contained full live orchestras. I met and enjoyed Alywyne Potts and her parents and on many occasions escorted her to the malt shops, the restaurants and movie theaters. In those days the entire city of Wellington was blackout due to the war scare. There were no automobile lights; no streetlights and all the homes and business properties were required to keep their windows dark and blacked out for fear of an enemy air raid. One evening Alywyne and I were in a movie theater when, unexpectedly, the screen shook ferociously. It was the first earthquake I had ever experienced. I was very frightened as everyone hurriedly exited the movie house and entered the dark streets. On the sidewalks we found broken glass and falling building bricks. When everything settled down Alwyne and I found a malt shop and after ordering our milk shakes there was another earthquake even more violent than the first. I was again very frightened as I saw the ceiling chandeliers violently swaying and the walls shaking uncontrolled with thunderous noise. I ran out of the building to the street and then realized that I had neglected to bring Alwyne with me. I was so embarrassed. Over the years Ruth and I have returned to Wellington many times. Every time we visit Alwyne in Wellington she always teases me about the time I left her sitting in the malt shop booth during that earthquake in 1942, some sixty five years ago. While the 1st Marine Division, were encamped in New Zealand, the division was only two-thirds full strength due to the fact that part of the division, the Seventh Marine Regiment, were encamped defending Samoa. During that period an American air force plane flew over Guadalcanal in the Solomon Islands and discovered that the Japanese had recently occupied the island and that their troops were constructing an airfield on the northern shore. Commanders of the American forces realized that if the enemy completed that airstrip the Japanese were in range and could easily bomb many Australian cities in preparation for the invasion of that country. 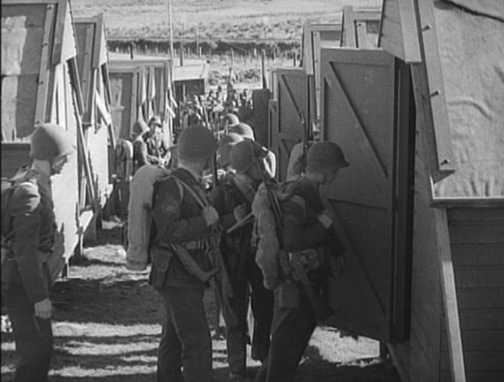 With the knowledge of that news we immediately received our orders to pack up and evacuate our Paekakariki campground and to commence the loading of American Naval transports docked in Wellington and also to prepare for the invasion of an unknown Pacific island. No one knew our destination at that time except Commanding General Vandegrift and it was not disclosed to us until we were at sea a week before the actual invasion date. We were shown very poorly hand drawn maps with no details of the Guadalcanal terrain. On July 22, 1942 the convoy fleet of eighty warships weighed anchor in Wellington harbor and set sail for the Fiji Islands. We still had no idea of our final destination and it was also unknown to the citizens of Wellington. We only knew we were off to war. My Marine brothers and I will never ever forget the tremendous farewell bestowed on our ships, its sailors and our Marine troops as we departed that beautiful land-locked Wellington harbor on that sunny July morning. The city itself is built at sea level but there are mountains of homes, schools and buildings built on the hillsides surrounding the great city. As the ships departed that harbor we were amazed as we watched thousands, yes thousands of the Kiwi citizens standing on the roof tops, in the windows, on the patios and in the streets waving large sheets, towels, handkerchiefs and flags wishing us “God speed” and good luck in the coming battle for freedom. After 65 years this grand and spectacular sight is still ingrained in my memory very clearly. What a sight. I will always cherish the New Zealand people for their impressive and public show of love for us that day. Four days later we arrived at Koro Island in the Fiji’s. During the practice landings on Koro, between July 28th and 31st, we lost over a dozen plywood hulled Higgins boats,(troop landing craft) on the coral reefs in shallow water. The maneuvers were somewhat of a disaster before we headed for our final destination, Guadalcanal in the Solomon’s. Luckily the movement of the entire fleet of eighty ships sailing to Guadalcanal went undetected by enemy aircraft because of constant rain and cloud cover those few days. As the ships arrived off Guadalcanal on the morning of August 7th, 1942 the skies were still overcast assuring of no enemy aircraft detection. Our transport ship came to a stop approximately a half-mile off the designated beach landing area. From the early morning hours we witnessed our battleships, cruisers and destroyers pound the shoreline as they relentlessly fired hundreds of shells, without mercy, into the northern enemy shoreline while Marine and Naval aircraft, launched from the aircraft carriers, dropped their bomb loads on small buildings, supply storage dumps and enemy fuel tanks. We saw an abundance of black smoke indicating that many targets had been destroyed in preparation for our landing. Around 6 a.m. and after a light breakfast we were ordered to climb down the cargo netting alongside our troop transport ship to board our landing craft. There were approximately thirty-six men in each Higgins landing craft. As the naval gunfire continued to plummet the shore all the boat group circled in the transport area until ordered to “Land the landing force”. The Higgins boats then formed into landing waves or groups for the rough ride to the shore. 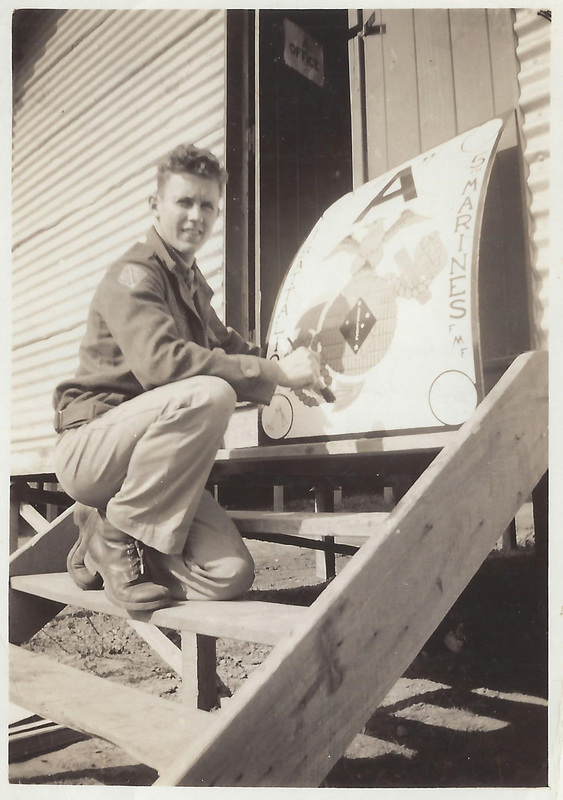 I was then a Corporal squad leader of nine men in the first platoon of “A” company, which unluckily drew the distinction, by the toss of a coin, of being the very first wave and the first to land on “Red Beach” that cloudy, August 7th morning. My squad consisted of PFC Ethan Allen Farrar, KIA, (killed in action) from Alabama, Privates Stocky Dunn from Philadelphia; Doy Cooper, KIA, from Georgia; Joe Porter, KIA from Virginia, Bill Maloy from Portland, Maine and the three Shedd brothers, Don, Bob and Paul from upper state New York and Vermont. As our Higgins boat headed into the beach landing area we were ordered to stay on our knees for greater balance. Due to the high bow we were unable to view the landing area from our low position until we were close to shore. When we were close to shore we first saw the tops of the coconut palms, which appeared over the bow of vessel. The boat plowed into the soft beach sand and everyone jumped into the shallow seawater and headed for shore. Fortunately we had no resistance from enemy fire due to the fact that during the early morning heavy shillings and bombings by our ships and planes the enemy had left the beach area and scattered into the hills for safety. Prior to our beach landing we had been informed by our intelligence officers that Japanese enemy aircraft would bomb us around twelve noon. That intelligence statement was only minutes away from becoming absolutely correct as a fleet of 36 Betty bombers appeared overhead at an altitude of 10,000 feet that day. They dropped their bombs loads on the American ships off shore sparing the Marine troops ashore mercy for at least another day. Upon landing on the beach we immediately advanced, approximately 100 yards, into the thick inland jungle and waited for orders from the command post. Without resistance and in the early afternoon we had crossed Alligator creek, the Tenaru River, and headed west for Kukum village through the heavy brush along the shoreline. In Kuhum we found empty huts with dishes on the tables full of food and untouched which indicated to us that the enemy had left in a hurry as breakfast was being served. When darkness fell that evening none of us slept for fear of a counter attack. Upon hearing noise in the thick brush all of us fired our weapons thinking it was the enemy but during the early morning hours the following morning we discovered that we had killed some cattle including a horse. While the 1st Marine Regiment secured and surrounded the new built airfield our lst Battalion defense area extended along the beach from the village of Kuhum to the east bank of the Lunga River. During the second evening of August 8th our fleet of ships remained off shore unloading the vital supplies that we required for our survival ashore. It rained that evening as we slept in our individual foxholes that we had dug for our own protection. During that dark evening a Japanese fleet of fourteen warships sailed undetected into the waters offshore and sank three American cruisers, the Vincennes, the Juneau, the Quincy and the Australian cruiser Canberra, the troop transport Elliot and the destroyer Benham. When Pacific fleet Commander Admiral Nimitz heard the devastating news the next morning he ordered the rest of convoy of ships to evacuate the area before further loss. Unfortunately our sea bags and food supplies were still on board the vessels and were unable to be put ashore before the ship’s departed. These personal sea bags contained our toothbrushes, our shavers, combs, soaps and additional clothing and other personal gear. Furthermore, to make things worse, no additional ammunition, weapons or gear were off-loaded before the fleet of ship left the area. On the third morning of August 9th and hearing the sad news of the fleet’s departure, our Captain gathered us together and informed us that what ever we carried in our back packs was very vital because there would not be any additional replacement of food, clothing, gear, water or ammunition in the foreseeable future. He also made the depressing statement that Guadalcanal would probably be another Wake Island fiasco and for each of us to make every shot count for, in effect, we were abandoned. The lst Battalion defense area extended along the beach from the village of Kuhum to the east bank of the Lunga River. Every day our platoon patrolled deeper into the western coconut palms. During the third day my good buddy Phil Matteson from Rhode Island was on “point”, (about a hundred feet ahead of the remaining platoon of men), when we heard a shot but were unable to detect where it came from. We all hit the deck and looked and listened. Phil, on point, happened to be directly under the palm tree where the enemy soldier was located. He was lying in prone position with his rifle aimed straight ahead when a bullet, shot by the soldier tied to the top of the tree, entered Phil’s left vertical positioned arm at the wrist. It penetrated completely through the arm to the elbow. The last I saw of Phil was when he ran past me holding his bloody left arm. The rest of us fired into the coconut palm tree and killed the sniper in the treetop. The Japanese soldier never fell but his rifle fell to the ground. Phil was evacuated two days later, via a DC-3 hospital plane, for treatment in American Samoa. While on patrol beyond our lines on the fourth day we observed a Japanese officer on horseback coming down the row of palm trees directly towards our platoon of 30 men. Our gunnery sergeant ordered us to hold our fire until the horseman came within close range. When the rider was within 150 feet of our position Platoon Sergeant Telegus ordered the rider, an officer, to halt and dismount but received no response. The rider quickly turned the horse around and headed west. The entire platoon of 36 men fired at the rider killing the horse. As the horse fell to the ground we kept firing. The rider jumped off the horse as it came down and immediate ran down the line of palm trees and out of sight. We were all bewildered that we had not hit the enemy officer as he ran out of sight. We called that “Buck Fever”. However, three days later when we were on patrol further west when we found a dead Japanese officer with hundreds of bullet holes in his body. During the fifth day we observed large white flags being waved by the enemy on the beach some four miles west of our A company defense position at Lunga Point. After informing our intelligence chief officer Colonel Goettge, he immediately gathered 30 volunteers and set out by Higgins boat to make a landing in the area where the white flags were last seen. I was asked to volunteer for that landing but fortunately I had sense enough to decline. 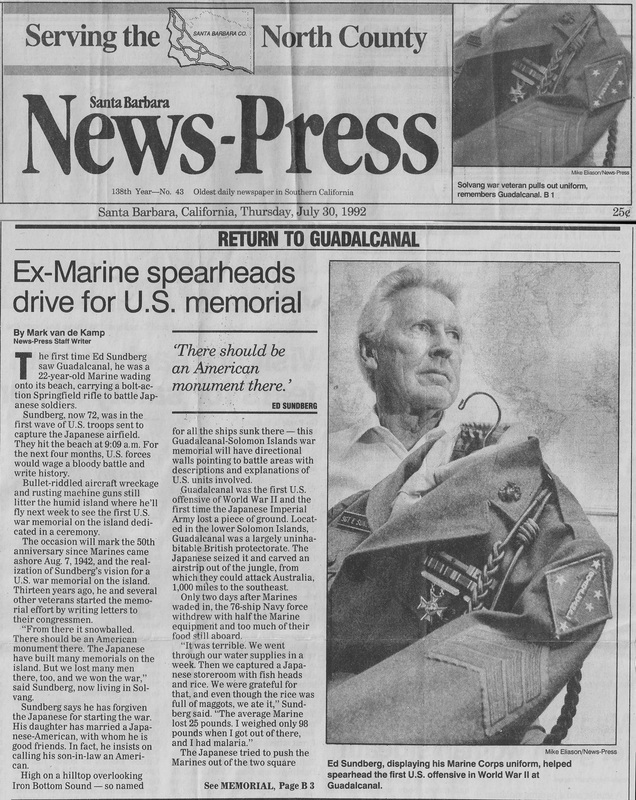 That patrol was not heard from until the return of three Marines who were fortunate enough to escape by swimming to sea and returning to our area the next morning. They reported that the rest of the patrol had probably been wiped out during landing. That afternoon a large contingent of Company A was then dispatched to find and rescue the last patrol. We set out in another Higgins boat and landed a half-mile east of where the Goettge party was ambushed. Hiking our way west we found no enemy but did discovered the bodies of our Marine brothers who were ambushed. A few of them were tied upright to the trunks of the trees with their throats cut from ear to ear. It was a very horrible sight and brought us much anger. While our 5th Marine regiment were defending Kukum Village and probing the Matanikau River, the first major attempt to overrun the Marine perimeter was made by the crack Japanese Ichiki Detachment on the night of August 17th. That enemy detachment consisted of over a thousand elite Japanese soldiers that landed, (from submarines), on the beach by rubber rafts that hit the lst Marines lines close to the Tenaru River. The 1st Marines were victorious in that all night dark battle. We in A company were also on beach defense and were less than 200 feet west of the Ichiki battalion beach landing area. We heard the heavy noise of rifle and machine gun fire, which kept us awake the entire night. The next morning the sight on the beach was devastating with hundreds of dead enemy bodies in the sand. We soon called Guadalcanal Starvation Island because we had no food supplies whatsoever. We consumed tree leaves, coconuts and captured a warehouse full of Japanese white rice which was filled with maggots and ants. We warmed the rice over open fires during the daylight hours after our commanding general ordered us to eat it because, as he claimed, maggots and ants were good protein. We also captured warehouses full of Japanese bottle beer which was warm but excellent tasting. It was rationed to us ﻿during each meal in lieu of of fresh water.﻿ The captured beer was found to be a blessing to us since we were not permitted to drink the fresh water from the rivers and streams coming down from the hills. Our Intelligence thought that the water, which was coming from upstream, might have been polluted and poisoned by the enemy. However, upon finding the Beer, one bottle was distributed and rationed to each one of us at every meal in lieu of fresh water, which was not off-loaded from the supply ships on August 7th. After our landing the Navy did off-load several hundred five-gallon metal containers filled with water that day, but unfortunately the water was not drinkable due to the fact the containers had previously been used as oil and fuel storage and they were not cleansed properly. The water supplied in those five-gallon containers was found to be almost black in color from the prior use. The command consequently ordered all the five-gallon containers destroyed for health reasons. After the fourth day on the island General Vandegrift ordered hundreds of bottles of the Japanese Sake destroyed when it was reported that dozens of men were found to be intoxicated on the front lines. The only fresh food we consumed during those months was the large and small fish we killed in the waters of the rivers and the oceans. This was the simplest of kills as we pulled the pin off many dozens of hand grenades and threw them into the nearby ﻿waters﻿. We lived like animals for the next three months. We slept in shallow foxholes with no protection from the night rains except for our small ponchos, which we kept over our heads. We had no pup tents or shelter from the nasty weather or from the falling enemy bombs and shells. The foxholes in which we slept each night were almost always moist, wet with rain, and always crawling with land crabs, rats, mice and bugs of all kinds. I well remember immediately after each rainstorm thousands of flying ants would appear and land on the outside of our ponchos. The ponchos were the only thing to supposedly protect us from the elements. These large flying ants would lose their wings after landing and then crawl down and into the poncho neck opening and bite into our skin. Along with this annoyance we were also subjected to listen to the night calls of the Macaw whistles from the trees tops and on many occasions we imagined that they were signals coming from the enemy. One of the fun things that we enjoyed many evenings was the opportunity to visit the tent of our Assistant Commander, One Star General Rupertus where we allowed to listen to his radio while “Tokyo Rose” was broadcasting to the American Marines from the Japanese mainland... She many times advised us to surrender before it was too late. She spoke English very well because she was born in the United States but currently was living in the country of Japan. We laughed and joked at some of the things she said and more than that, in between her ravings and speeches, the radio always broadcast the famous music of Tommy Dorsey, Glenn Miller and other famous American orchestras which we loved. We always felt “UP” after hearing that broadcast every evening even though the music made us somewhat homesick. During our four and a half months of combat in the Solomon’s and while we defended only a few square miles around the perimeter of Henderson airfield to the beach front we endured over 176 bombing from daily fleet’s of 40, 50 and 60 enemy aircraft. The Betty bomber fleets of Japanese aircraft were sent from Bougainville usual arriving overhead at noon each day. The Japanese Zero fighters strafed our ground positions countless times. Every single day we witnessed dogfights directly overhead and witnessed hundreds of planes, both American and Japanese falling to the ground in flames. As some of the pilots bailed out many of the parachutes were in flames and did not function or open as the pilots fell to their deaths. It was also annoying and disturbing when a enemy seaplane, “Washing Machine Charlie”, as we nickname it, was launched from an offshore enemy Cruiser to keep us awake all night. This enemy seaplane flew only 100 to 200 feet over the treetops every evening and randomly dropped five 100 pound bombs disturbing our rest. During those four and a half months we were also subjected to 78 enemy naval shellings, point blank, from 100 yards off-shore by enemy battleship, cruisers, destroyers and submarines. We also suffered explosions by hundreds of enemy artillery shells from what we called Pistol Pete’s, (150 millimeter artillery cannons), six inches shells, fired from enemy held Mount Austin six miles south west of our position. A few of us were killed during these enemy firings which took place during daylight hours because the enemy did not want us to discover their position. A couple of our company men went berserk from the hours of bombardment and near hits. Unfortunately, Bob Huber was hit directly with a one of those artillery shells and as a result we were only able to find small pieces of his body parts. Lever Brothers Company farmed over 150 acres and over 20,000 coconut trees along the northern coastline harvesting Copra for the manufacture of soap. When we left the island of Guadalcanal in December every single coconut tree was completely stripped and without a top, the trees looked like telephone poles without wires. The hundreds of Japanese bombings, shellings and artillery explosives did the devastation. We the American troops did not create that disaster. In returning to Guadalcanal with our fine son Richard on the fiftieth anniversary of the battle in 1992 I noticed that newly planted coconut palms were in full production and were again being harvested by Lever Brothers. In conversation with the current Prime Minister of the Solomon Islands I inquired of him, when were the trees replaced and by whom. His reply was: “They were replanted after the war ended and the United States government paid $5,000 to Lever Brother for every destroyed coconut tree”. During that 50th anniversary celebration of the 1942 battle I also observed a new Solomon Islands government capital building being constructed on the hillside behind the town of Honiara which resembled our own Washington Capital building but was very much smaller in size. I also understood that the Solomon government did not tax or collect any income taxes, property taxes or sales taxes from the citizen of their country. So again I asked the Prime Minister what was the cost of the beautiful capital building and where did their government acquired the funds to build such an elaborate structure. His reply was that the new building cost ten million dollars and that the Solomon Island government was awarded over eight million dollars by the United States Treasury for the construction of the new capital building. To this day I cannot believe that our State Department continually hand out American funds to anyone they please without advising the American public. No wonder the US is in debt! Before our evacuation from the island over 8,500 marines had contacted malaria. Many men died of malaria after yellow jaundice. This caused loss of weight and yellowing of the skin. The day we left that island of death most of us weighed only 90 to 100 pounds due to disease and the lack of food. When I arrived in Brisbane, Australia I weighed my self at only 95 pounds. I was skin and bone from lack of nutrition. During those four and a half months we were issued Atabrine and Quinine for malaria treatment but it did not seem to help many of us. In treating malaria disease today, especially in Africa where it is rampant, the medic is still prescribing the same two medicines. There are so many horror stories to tell, I could write a book, but I believe our darkest day was October 18th, 1942 when three squads from our platoon were assigned to cut a trail, with hand held machetes, thru the thick jungle, in a small valley a hundred yards south of Henderson field. We were clearing out a trail leading to the top of a ridge, over looking the airfield, for the construction of a new underground bunker and command post for General Vandegrift. That day our Marine F4F fighter pilots reached their attitude by early take-offs to meet the incoming enemy bombers flying from Bougainville. By their tremendous fire power the Marine F4F Hellcats deflected the formation of 50 Betty bombers away from Henderson Field so that the bombs would not fall on the airfield aircraft. The condition “Yellow” was past before the bombers reached our overhead position from where we could see that our fighter aircraft had already shot down six of the incoming Japanese Betty bombers. Just before the enemy aircraft were directly overhead they made a 180-degree turn to return to their home base. As they did they unloaded their 500 and l,000 pound bombs for gaining greater speed and maneuverability to avoid more loss from our F4F Wildcat fighter planes. When the condition “Red” was heard we were helpless as dozens of bombs exploded all around us as we laid horizontily on the ground without foxhole protection. As I heard the shrieks of the falling bombs I prayed for my mother’s womb to protect me from harm for we had no cover to protect us from the flying shrapnel. The noise was devastating overwhelming and today I realize how I eventually lost my hearing. The heavy dust created by the explosions did not clear the air for over forty-five minutes. I brushed off a six inch jagged piece of shrapnel that fell on my left arm dungaree sleeve which burned thru the cloth and scorched and burned my skin at the wrist. I attempted to pick the piece of shrapnel up about fifteen minutes later and was unable to because it was still very hot. Joe Porter was lying parallel to me on my left side and Ben Langowski was at my right side. I heard the screaming noise of pieces of shrapnel, wood, rock and dirt flying everywhere as one piece of metal passed my left ear by only a few inches and ended up slicing Joe Porter’s right leg in two. He died a few minutes later from loss of blood. Langowski was gone from a piece in the head. Before the condition “Red” was passed Doy Cooper, one of my best buddies, said to me that he thought the side of the hill would be safer and choose to leave our area, unfortunately we found that he had been hit by a small piece of shrapnel in the center of his spine as he was crouching face down on his knees. He died instantly. Every man still conscious was yelling for Corpsman, (medics), but when they arrived there was nothing much they could do for the nine dead and very little for the seventeen wounded Marines. Corpsman Haggard treated the seriously injured men before he applied sulfur to my burned wrist then bandaged the area. Those still living were very blessed to have another day of life. 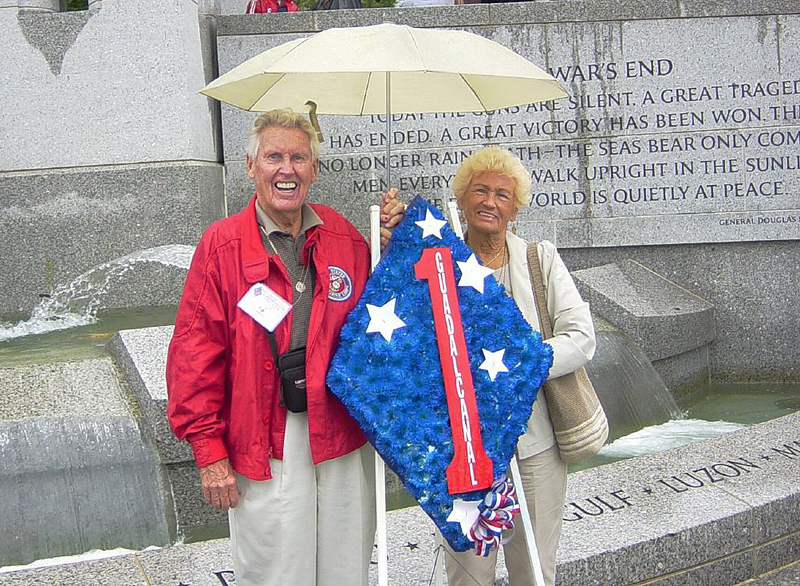 Doy Cooper and Langowski were brought home to the USA in 1948 and because they were orphans they were the first bodies to be interned, front and center, in the beautiful Punchbowl National Cemetery in Honolulu. On November 1st, my Dad’s birthday, the remaining ranks of Marines were now beginning to get very thin due to malaria sickness, wounds and death, therefore every able bodied man was needed for the crossing of the Matanikau River, (via fabricated wood bridge), and for patrolling and penetrating further west into enemy territory. On the 2nd of November our company occupied hill number 78 overlooking Point Cruz in the push toward enemy held Kokumbona. Waiting for further orders we discovered there were enemy forces in the valley below almost completely surrounding us. I stood up to take a look below and was immediately knocked down by 1stLt.Walter McIlhenny as a bullet flew over my head. I waved thanks to the man and later learned that he was the sole heir of the “Tabasco” fortune, the producers of pepper sauce on Avery Island in Louisiana. For hours and into the afternoon we were under siege from a barrage of hundreds of Japanese knee mortars coming from the enemy held valley below. We could hear the sound of each mortar missile as it left the barrel and watched their skyward arch. They did not travel very high, only a couple hundred feet into the sky before they started down to our hill top position. Fortunately while watching the mortars coming down from directly overhead, we made a mad dash and hit the deck a few yards away from the explosion. Fortunately fifty percent of those mortars that fell that day did not hit the ground at the correct angle and failed to detonate, causing them to be duds. Many of my buddies picked the duds up and threw them back into the valley and lo and behold most of them exploded and possibly killed a few of the enemy. Late that afternoon we were ordered by our battalion commander Maxwell to fix bayonets for a possible charge down the west side of the hill but luckily that order never came. Lt. Edlestein, our platoon leader requested that I to go back down the eastern side of the hill where we entered to ask our company commander Captain Kaempfer what should be our next move? The Captain, who was half way down the back side of the hill in a sand bagged protected bunker pulled his pistol, pointed it at me and ordered me to immediately leave because, as he yelled, I was drawing enemy fire on his position. I then returned to the hilltop and reported Kaempfer’s action and disgusting performance to Lt. Edlestein. Within an hour our company was ordered to retreat from the hilltop and take cover for the coming night. The next morning the command sent a full mortar detachment to that hill to secure the area. From the initial U.S. Marine Corps “red beach” landing by “A” Company, lst Battalion, 5th Regiment, 1st Marine Division at 9:09 a.m. on August 7th, 1942 until the Japanese evacuation of Guadalcanal in February of 1943 the U.S. and the Japanese Navies were engaged in many major naval battles, in addition, throughout the campaign, numerous smaller naval actions took place involving Battleships, Cruisers, Destroyers, Naval aircraft carriers, motor torpedo boats, cargo vessels, troop transports and submarines in which planes and ships of both sides were damaged or sunk. There were over 1,200 American and Japanese aircraft destroyed and shot down and more than eighty Japanese and American ships sunk in the sea waters between Guadalcanal, Tulagi and Savo Islands, only six miles distance from the shores of Guadalcanal during the first five months of action. The human losses were more than 7,100 aviators and sailors from both sides. Before the Island was secured there were seven major naval battles at sea, mostly taking place in darkness of evening only a few miles off our beach position at Lunga point? We witnessed each battle and a multitude of explosions and sinkings and felt great pity for the suffering of our great sailors. Before we were through we had buried hundreds of headless and limbless rigor mortis oil stained Japanese and American bodies, which from time to time floated ashore. The Heavy Cruiser USS Juneau was sunk the night of August 8th, which took the lives of the five Sullivan Brothers. Congress then passed the Sullivan law prohibiting any two brothers from serving together on any one US Naval ship. The Pacific waters off Guadalcanal were thereafter named “Iron Bottom Sound” for there were over eighty naval ships sunk off shore. Today, “Iron Bottom Sound” is known as the largest graveyard of naval ships in the world. American and Japanese rigor mortis bodies, covered with oil, washed up on the shores of Guadalcanal for weeks after each Naval engagement. It was the responsibility of the U.S. Marine Corps personnel to identify and bury the corpses. A couple of more stories you may get a chuckle out of: During our occupation of that dreadful Island. We had collected dozen of, (from the bodies of dead Japanese), Rising Sun flags, swords, hari-kari knives (use by the military for suicide by ripping open the abdomen with a dagger when disgraced), and other memorabilia. We traded those souvenirs to our Marine aircraft pilots at the airport in exchange for beer and liquor that they always carried in their aircraft cockpits. Another story can be told about the landing of the 182nd Army Division. The day they finally arrived to relieve what was left of our depleted and exhausted Marine 1st Division the Army unit piled up hundreds of boxes just inshore of the beach. The storage area was approximately 200 feet long and 10 feet high. We discovered that the Army boxes contained food goods so when our Captain Kaempfer was notified and told about the contents he immediately instructed eight of us to drive our captured Japanese flat-bed truck to the location and to get as much as we could handle to bring to our company bivouac area. Spit and polished and clean-shaven Army soldiers dressed in jackets, shirts and ties continuously patrolled and guarded the food dump area. They carried brand new M-1 Gerrand rifles over their shoulders as they guarded the supply of goods. We brazenly backed our truck up to the boxes and completely overloaded our truck with boxes of Canned Evaporated Milk, Corn Flakes, Cans of Spam, Boxes of Candy and Jars of Canned fruit and vegetables, all of which we had not seen or eaten in months. We had no resistance or communication from the Army sentries in loading our truck as we Marines were all unshaven with beards, dirty with long hair, filthy clothes and looked exceptional grubby. Upon delivery of that wonderful load of goodies Captain Kaempfer ordered us to return for another load. Returning and reading the carton labels we discovered containers of new M-1 automatic rifles and hastily loaded them on our truck and again returned to our bivouac area. The men of our Company were elated when they open the crates and found the brand new rifle weapon. Every one of us grabbed an M-1 rifle, cleaned the heavy protective grease, loaded the weapon and made a few test shot into the air. We found the new M-1 automatic rifle to be far superior to our old 03 Springfield rifles. During the four and a half months in action on Guadalcanal every one smoked cigarettes. After the Naval forces abandoned us on August 9th. We were left without our sea bags, without food, drinkable water, ammunition supplies, and additional weapons and also without cigarettes. The day after our landing we had smoked our last packages of cigarettes, which we had carried ashore in our backpacks only to find no additional packs available to smoke until we captured warehouses full of Japanese cigarettes, Sake and bottled Beer. Since the Japanese were not able to import tobacco from the United States, the cigarettes were manufactured from ground up tealeaves. These cigarettes were wrapped in white paper the same length and width as the American cigarettes. The taste of the Japanese cigarettes were not anywhere the same as an American cigarettes which were made from pure tobacco. Matter of fact the tealeaf cigarette had an offensive odor compared to the American made Lucky Strike, Old Gold and Chesterfield cigarettes. During the month of November we were happy to receive our first mail call from our loved ones back home. On the evening that the mail was distributed to many of us Harry Leber, a rifleman in our platoon from Union City, New Jersey, received a package from his folks, which he did not open until after it was dark. Approximately twelve of us were off the front line that evening sitting around and chewing the fat when Harry secretly opened his package and discovered his folks had sent him a carton of Lucky Strike cigarettes. Harry put his poncho over his head to hide the flames from enemy sight and lit up his first American cigarette in months. After the cigarette was lit he came out from under the poncho and took his first puff or drag on the cigarette and exhaled it. The entire gathering of men around him could tell the difference in the smell of a Japanese cigarette and an American cigarette and simultaneously everybody in the group yelled: “Who the hell has the American cigarette?” That moment will never leave my mind for Harry was very generous in sharing the cigarettes with everyone. 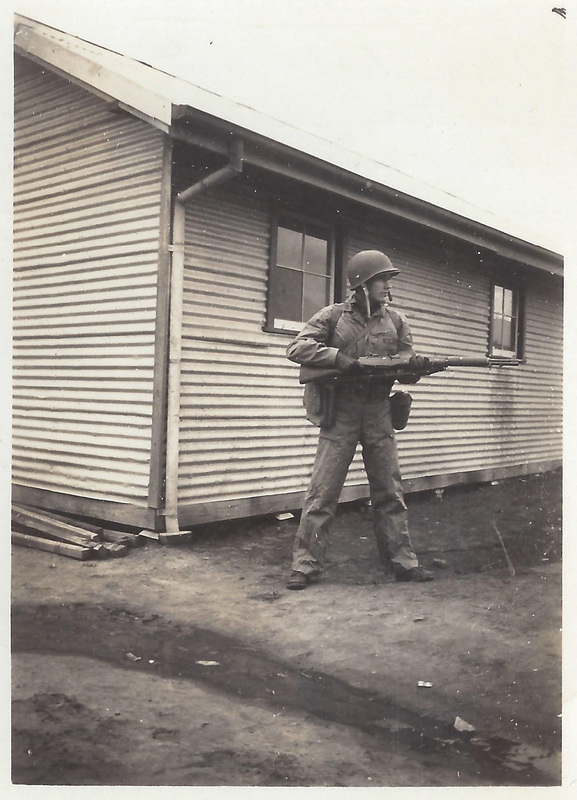 In the end and upon arriving in Melbourne, Australia the latter part of December of 1942 I realized that I had entered the Marine Corps as a very shy young man but after seeing half the world and experiencing the horrors of the war I had become a man, a man with much greater knowledge and sense of human sacrifice and honor for those around me. During the ten months of recovery in beautiful Melbourne I had become more humble, more giving, more understanding of those around me and only then under stood the true meaning of the words, honesty, sincerity, integrity and ethics. While the Marines were in that beautiful city we all were treated as heroes by the Australian public. All of us had wonderful experiences with the Aussie citizens. ﻿Harry Leber was one of my best buddies, not only while were in ﻿New River, North Carolina but also during the entire action in the Solomon’s and later while we were recovering and stationed in Melbourne, Australia during the year 1943. We went on many five-day liberties together in that city. When the men of our Company were issued new sets of Green Dress Uniforms they were very wrinkled and had not been pressed. Wearing the greens while on our first liberty Harry and I found a tailor on Collins street downtown and requested him to press them for us while we were undressed. The tailor was Ed Strapp, a gentleman in his late thirties who would not accept our payment for pressing our uniforms. His claim was that we had saved Australia from Japanese invasion by capturing Guadalcanal. 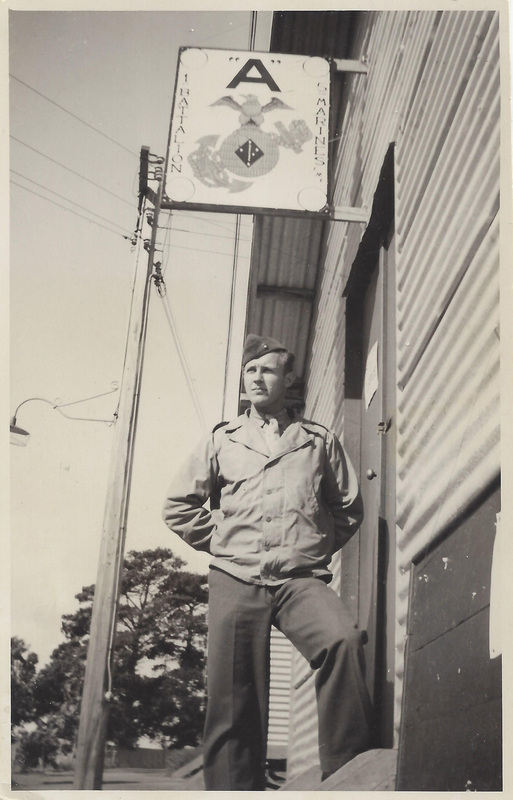 After the pressing was done Ed Strapp closed his shop and escorted us to Young and Jackson’s Bar on Bourke Street just across the street from Flinders Railroad Station. He introduced and treated us to a couple of “Bombshells”, which is a tall glass of beer with a shot glass of whiskey dropped into the glass. He would always chug-a-lug the entire beverage in one continuous draught and soon had us doing the same thing. 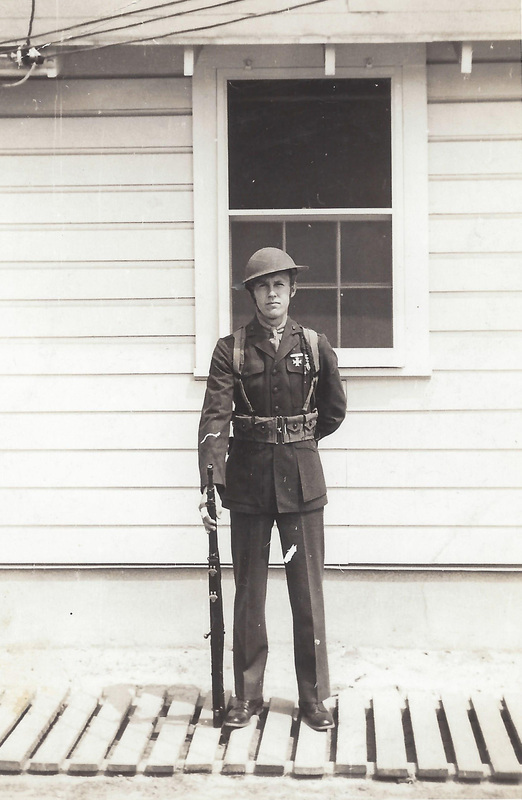 I continued to see Harry Leber, a fine Christian, at many of the annual First Marine Division reunions, which were held each year in different U.S. big cities. Several times while we were in New York City on business or pleasure Harry and his wonderful wife, Winnie would always drive across the Hudson River from Union City, New Jersey to meet Ruth and me for dinner in Manhattan or drive us back to New Jersey for dinner at their Country Club. During September 11th while Ruth and I were stuck in New York we were scheduled to meet the Leber’s for dinner that same evening but he phoned our hotel and regretted that he was unable to drive through the Holland Tunnel or over any of Hudson River bridges to meet us because all bridges and tunnels had been closed to vehicle traffic after the downing of the Trade Towers. That was to be the last time I ever spoke to my Marine brother. Harry was an undertaker and ran one of the most successful funeral homes in New Jersey before he passed away at the age of 86 two years ago in 2005. Before his death he related to Ruth and I that over last ten years he has gifted two million dollars to every one of his five sons. Being a funeral director must be very profitable. I am happy he was so successful because Harry and Winnie gave an abundance of community service back to their New Jersey and Florida communities. ﻿While in recovery at Camp Balcome in Melbourne during the year 1943 Harry, his brother in law Tom Sweeney, Leo Hennigan from Pembroke, Mass. and I would always attended the Friday and Saturday night Melbourne ballroom dances to meet the local girls. To our delight the live 20 piece orchestras played all the great music of the thirties and forties for dancing. During most of the year the men of the First Marine Division were the only young men in Melbourne because at that time the Australian Ninth Division were fighting German Field Marshall Rommel's, (the desert fox), troops in North Africa. When the Aussie ninth division did return to Australia in the month of October there were fights in the streets over the jealousy that American Marines were stealing their women. As a result our commanding general restricted the entire lst Marine Division to our Balcome campground and from liberty into Melbourne for a two-week period. After that restriction things seemed to cool down because most of us behaved ourselves in that city. An unfortunate fact about the Australian Ninth ﻿Division was they had brought back a contagious African gonorrhea, which spread, to the American troops like wildfire, this caused a shipload of 800 troops to be returned to the USA for treatment of the disease. Apparently there was something missing in the fresh water that prevented the curing of that disease. In those days there were no antibiotic medicines and most sickness was treated with sulfur drugs, which did not do the trick in healing the terrible disease. We all learned in later weeks that those 800 men, who were returned to the United States, were cured within seven days after arriving in the United States. We were in Camp Balcome for five days and then were on authorized liberty for the next five days during the entire eleven plus months while in beautiful Melbourne and until we were fully recovered from our weight loss, malaria and wounds. Every five days that I was privileged to spend with the Strapp family was simply a wonderful pleasure. They treated me like a son, gave me my own bedroom and on many mornings I was feed breakfast in bed by lovely Mrs. Jean Strapp. They loaned “me” their charcoal burning automobile, they took me to the horse races, to the rugby games, to the soccer games, to the theater and even invited me to Valerie’s sixteenth birthday celebration. They were wonderful to me in every respect for the entire year. Ruth and I paid them our first visit in 1969 on our twenty-fifth wedding anniversary trip. After our flight from Los Angelus and upon our midnight arrival at Melbourne airport the entire Strapp family, Jean, Ed and their children, Lorna, John, Valeria and Ted were there to welcome us with flowers of love. As we disembarked the airplane they were holding up a framed photograph of me taken in my Marine Corps uniform which I had given them before I left Australia in gratitude of their overwhelming love and kindness to me. I had signed it, “To my Australian Mother and Father.” During our 1969 visit we offered them a trip to America in gratitude of what they had done for me, but unfortunately they could not accept our invitation because Mrs. Strapp was too ill to travel. To me all Aussies and Kiwi’s people are totally genuine along with being the kindest, most generous, and friendliest people in the world. I painted all the headquarters and company signs in Camp Balcome, Australia.